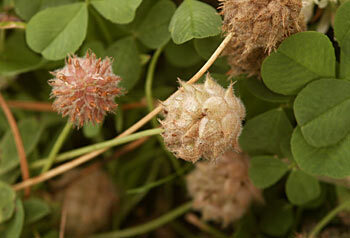 AgroAtlas - Relatives - Trifolium fragiferum L. - Strawberry clover. Family Leguminosae Endl., genus Trifolium L., sect. Trifolium ex D. E. Coombe. Perennial herb. Stems prostrate and stoloniferous, 5 to 50 cm long with erect petioles and floral stalks, stems hairy or smooth. Leaves trifoliate, 2 to 20 cm long, congested or loose, with long hairy or hairless stalks. Leaflet 0.5 to 3 cm long, 0.3 to 1.5 cm wide, obovate to elliptical, occasionally round, blunt, often indented at the tip, finely toothed, hairless or hairy along the veins and margins. Stipules reach 2 cm long, lance-shaped, dilated and white papery towards the base and with a sharp pointed free portion. Inflorescences globular and compact, 10-12 mm in diameter, with pink or purplish red florets and when ripe, become reddish and resemble strawberry fruits. The blooms appear earlier than those of white clover. There may be 35 to 60 florets per head. Only one seed forms in a floret. As the seeds mature, the head takes on the appearance of a balloon. The flowers are extremely attractive to bees for both nectar and pollen. After pollination in summer by bumble bees and honey bees, the pubescent fruiting calyces contain 1-2 seeds each. Seeds are heart-shaped and colored light brown with dark brown flecks. Cross fertilized. 2n = 16. Moderately distributed in mild, temperate areas, e.g. S. and C. Europe, W. Asia, all Mediterranean countries; European part of the former USSR, Crimea, Caucasus, Siberia, Kazakhstan, Asia Minor. Species grows in grassy and muddy areas, and sometimes salty places. It is adapted to poorly drained soils with high water tables even though plants become shallow-rooted; also suited to wet saline or alkaline soils. N-fixing, protein-rich species particularly adapted to waterlogged and/or saline soils, and to heavy irrigation. Species is suitable for hay and silage. It is tolerant to close continuous grazing on account of its stoloniferous growth habit. Has cool-season growth in mild temperate areas. It is intolerant of shady areas. Moderate drought tolerance that is better than white clover. It is tolerant of flooding. Hulten E., Fries M. 1986. Atlas of North European Vascular Plants, North of the Tropic of Cancer. Konigstein. V. 1-3: 1172. Mosel H. 1965. Comparative Chorology of the Flora of Central Europe. Jena. 583 p.